These griddle biscuits are fried rather than baked, and turn out excellent when cooked above a campfire. Roast whatever fruit you have on hand to make a fruit butter topping. Homemade griddle biscuits in the woods? Heck yeah. Biscuit dough is quick and easy if you know how to do it right and the results can be incredible. 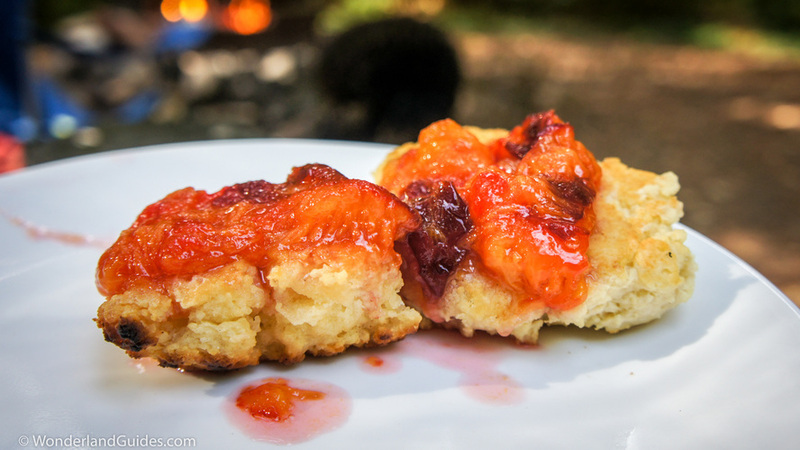 Before you go slinking off to your can of Grands (which also work fine, btw), consider how much your lover will swoon and your foes from the adjacent campsite will tremble when they see you whip-up a batch of homemade biscuits above a campfire. This recipe was a big success and just the kind of comfort food we needed after returning to camp after four days of backpacking. Combine the flour, baking powder and salt in a bowl. If you can, use cold butter. Cut it into the dry ingredients with a couple of knives, a fork, a pastry cutter or your fingers. If you use your fingers for this, work quickly so your fingers don't warm the butter. Slowly add the milk while you stir the ingredients. You don't want to smooth the dough -- you want it to clump and just barely stick together. If you over-mix the dough the biscuits will be tough. Note that reconstituted whole powdered milk works great. Heat a hearty slab of butter in a skillet or griddle just until melted. The key to griddle biscuits is not over-heating the crust, so you want to add the dough when the pan is still relatively cool. Divide the dough into 6 to 10 portions depending on how large you want the biscuits. Drop the lumps of dough into the warm skillet. Fill up the pan so the edges of each biscuit just barely touch. Fry the biscuits over low to medium heat until golden brown on the bottom side. Depending on the temperature of your pan, this will take around four to ten minutes. If the edge is browning too quickly, pull the pan back away from the heat to lower the temperature. When the bottom edges of the biscuits are a warm golden color, flip the biscuits and fry the second side. Serve steaming hot, topped with butter, honey, or fruit. You can use any fruit you wish for this recipe. We had some extra plums on hand, so that's what we used. Add a little butter and sweeten with sugar to taste. Wash the fruit, remove any stickers and tightly wrap it in tin-foil. Rake a bed of hot ashes out of the fire and place the wrapped fruit on the ashes. Rotate the wrapped fruit every five or so minutes to ensure even heating. As long as the temperature doesn't get too hot, you won't be able to overcook the fruit. You want it to feel very soft to the touch through the aluminum foil. When the fruit feels soft, unwrap it and add it to a bowl. Remove any pits and skins (or leave the skins in). Mash the fruit with a fork. Add sugar to taste and a little butter if desired. Serve warm on a stack of griddle biscuits.